Sings a new song to the new year—and you? ** ‘Throstle’ is an older word for song thrush. Bryan Adams served as Environmental Education Coordinator for the Mid-coast Wildlife Refuge Complex: the Brazoria, San Bernard, and Big Boggy refuges. He was dedicated to educating people — especially children — about the wonders of nature; each year, the refuge programs provide learning opportunities for up to three thousand elementary and secondary students from local school districts, the Houston School district, and Rice University. 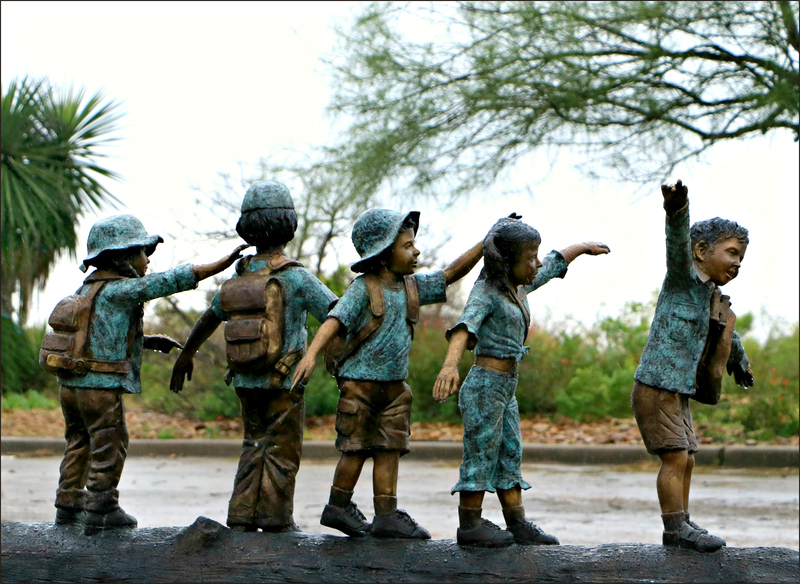 After his death, the bronze sculpture of the children was selected as a fitting memorial. A dedication for the sculpture and a new pond is planned for January. One of the world’s best-loved Christmas carols, “Joy to the World” includes lines that suggest both heaven and nature celebrate the feast with their songs. 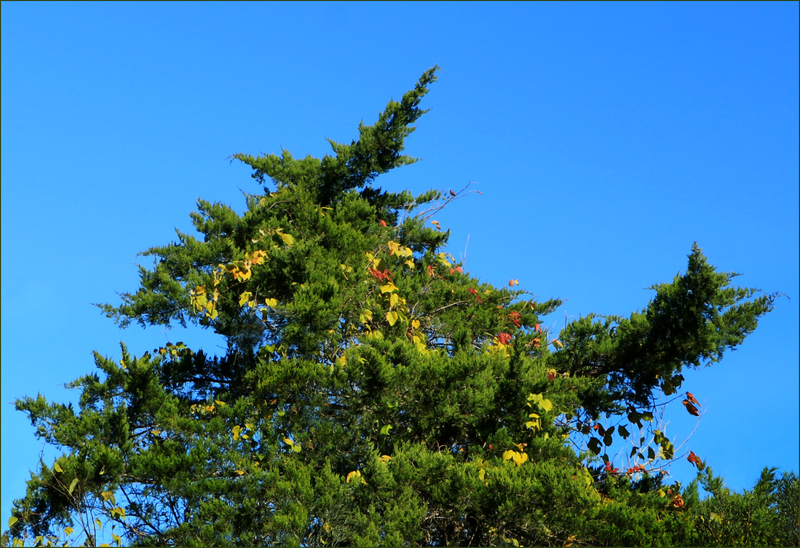 What’s less well-known is that nature, too, likes to decorate its trees a bit for the holiday. Here, an Ashe juniper shows off a simple but elegant garland. 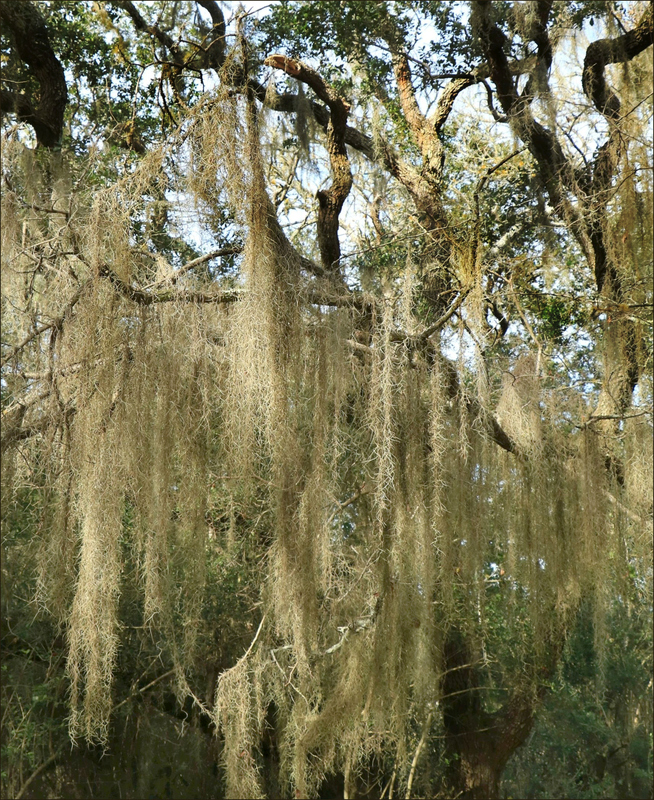 Spanish moss dripping off the limbs of this live oak doesn’t sparkle, but it drapes as gracefully as any tinsel. 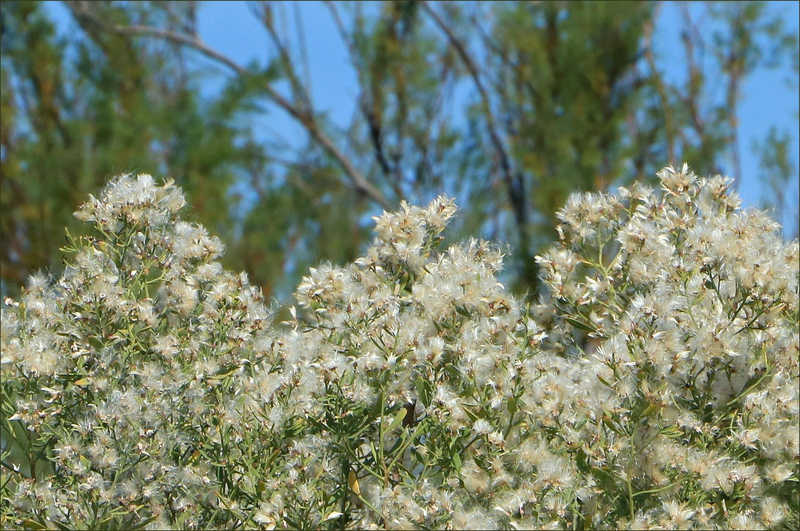 Seen against a choir of salt cedar trees, this tree-sized poverty weed wears its white fluff like old-fashioned angel hair. 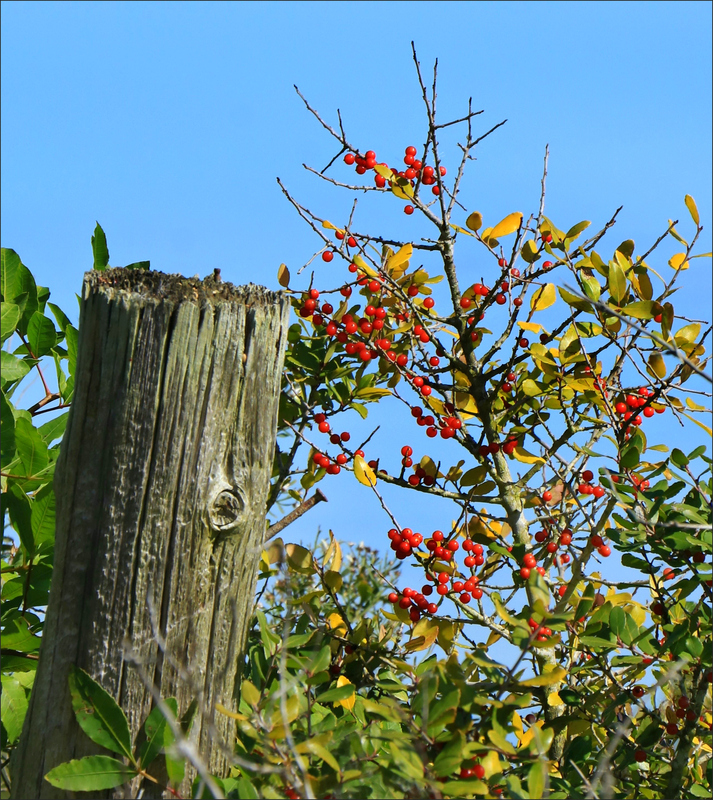 Even this young possumhaw brightens the day with its collection of seasonal baubles. They may decorate its branches well into the new year, but only if the birds stop nibbling at them like children at a cookie tray. Whether you have a tree, or many, or none in your home, nature has a multitude of trees just waiting for your admiration. If you take time to seek them out, they might even invite you to join in their singing. This little marvel munching away on a gaura leaf, clearly unwilling to interrupt his meal in order to tidy up for the camera, has been tentatively identified as the larva of a white-lined sphinx moth (Hyles lineata): the same moth I featured recently on The Task at Hand. The first time I saw the creature, I dissolved into giggles and immediately dubbed him the Big Green Guy. His vulnerable chubbiness, his tiny, multi-purpose feet, his air of concentration, his apparent lack of embarassment at being revealed as a messy eater: all evoked a response of absurd protectiveness. Eventually, I purchased and hung a print of the creature on my wall. A neighbor said, “You might as well have mounted a collection of cockroaches.” I considered her judgment unnecessarily harsh, and said so. “To each her own,” she said. 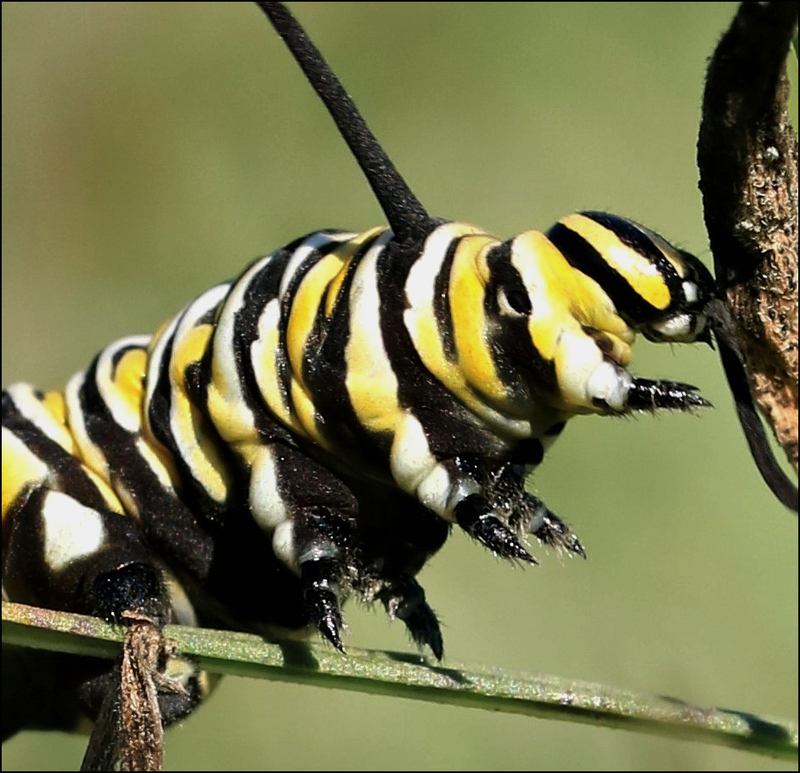 Over the months, I began to wonder why I never had found a caterpillar. 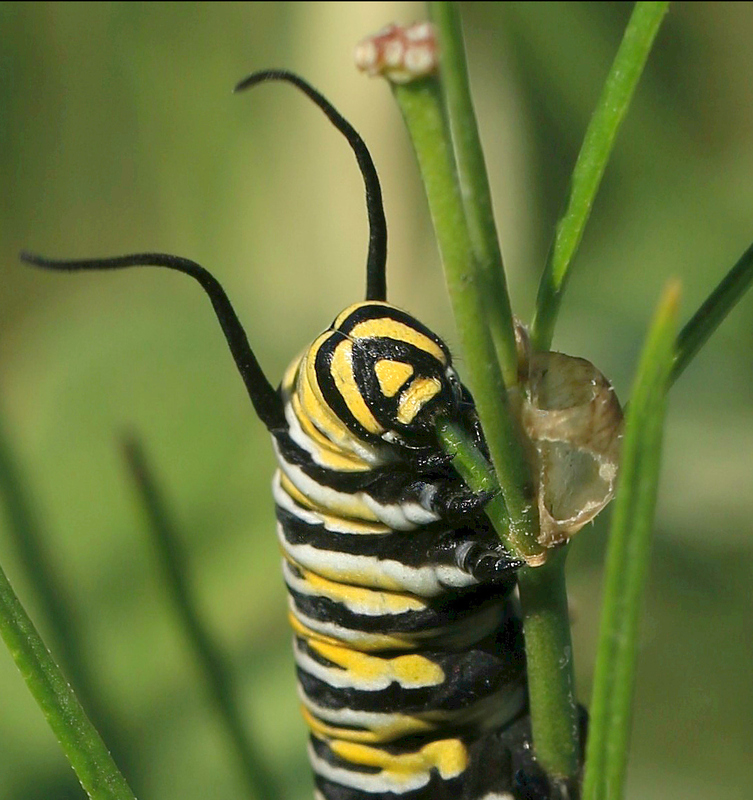 I saw monarchs being raised here and there, and occasionally a friend would find a chrysalis hanging from a lawn chair or a shrub, but caterpillars of any sort evaded me. Then, in late October of this year, I noticed yellow tape along a roadside, attached somewhat casually to stakes. Suspecting that someone might have marked a milkweed patch, I stopped to explore. 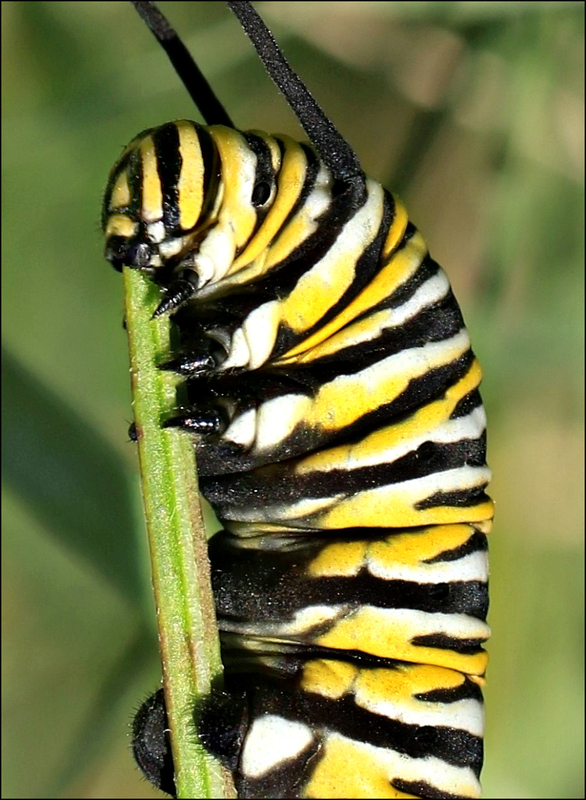 When I did, I not only found milkweed plants, I found a group of monarch larvae happily feeding: as plump and adorable as the Big Green Guy. This one appeared to be sampling a stem. A second was making short work of what seemed to be an especially tasty plant. 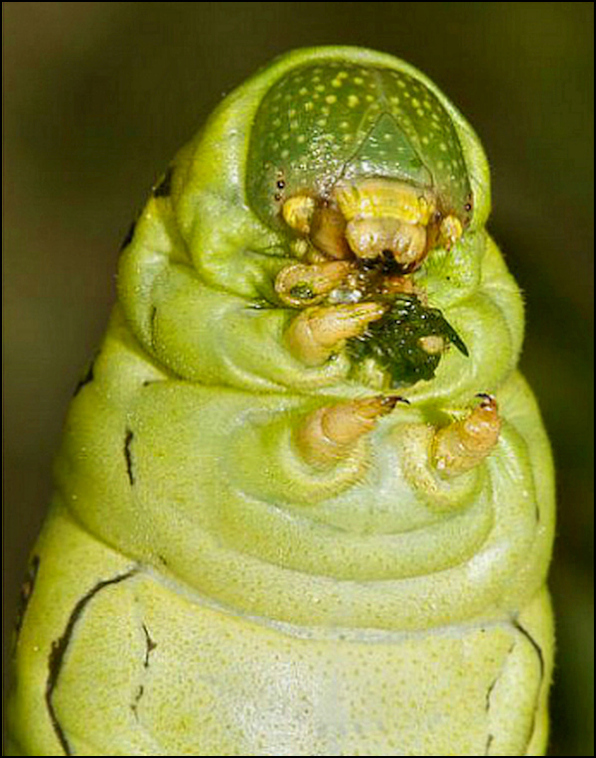 At the time, I didn’t notice what appears to be an empty chrysalis nearby. Focused on eating as much milkweed as they could, as quickly as possible, the group clearly wasn’t interested in posing, but they provided a wonderful hour’s entertainment. Indifference to all the actions and passions of mankind was not supposed to be such a distinguished quality at that time, I think. Yet I have known it very fashionable indeed. I have seen it displayed with such success that I have encountered some fine ladies and gentlemen who might as well have been born caterpillars. Dickens might have sought a different analogy, had he met the Big Green Guy and his friends.